In recent years, interest in Unmanned Aerial Vehicles (UAVs) has greatly increased. Consequently, there has been much interest by academic institutions in setting up laboratory environments for research related to UAVs and related subjects such as machine learning and SLAM. However, currently there is not much documentation for the setup of such labs and thus planning such a lab as well as designing a drone to act as a testbed for experiments can be a time-consuming process. Additionally, flights within indoor spaces is another challenge that industry aims to solve within the next 5 years. We have established the documentation for the setup and testing of a new quadcopter, featuring the Otus Tracker and the Otus quadcopter for precise indoor motion capture of the UAV. In a spirit of openness, to foster research and innovation, we are also releasing the complete documentation to replicate our quadcopter kit. This can be useful to build a quadcopter with motion capture from scratch, or to modify the Otus quadcopter. The section Otus Quadcopter kit assumes that you bought the complete kit. The section DIY Quadcopter assumes that you are building the quadcopter from off the shelve components and setting up everything yourself. Most universities and research groups take approximately 1 year to get their drone reserach labs up and running. 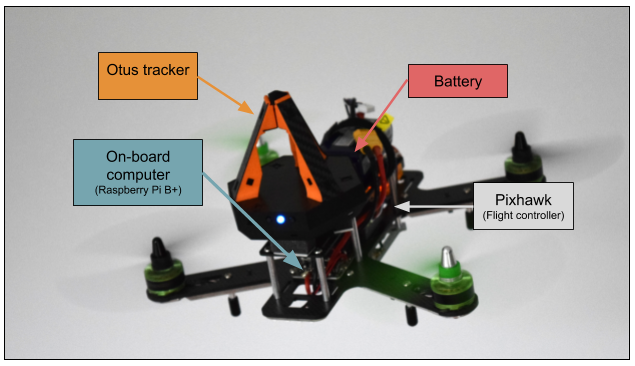 This document will highlight the hardware required, as well as the setup needed to create a flying quadcopter using the RCbenchmark tracking lab software. Our quadcopter is based on the PX4 platform. The PX4 platform is well documented, well supported, and is currently used for cutting edge research, as well as for commercial platforms. Once you have completed your development indoors with motion capture, you can use the Otus system and the Steam VR light house tracking system for commercial deployment. The Pixhawk platform can also be used outdoors for commercial applications. Some the the tools used in the Otus quadcopter. You can also build your own quadcopter using this documentation. LCD screen for status messages and user messages.